Our most popular procedure is our SmartLipo laser fat removal procedure. I'm sure you may have heard of liposuction. And it is just as scary as it sounds - tubes, and scars, and out of commission for days. However, new laser lipolysis allows doctors to use a small tube with a laser to melt fat, then take it out through just a fingernail size cut in the skin. SmartLipo is laser-assisted lipolysis. Fat can be removed from a small area with the help of oral medications before the procedure. It is done in the office in just a few hours. Your body will be sore for 2 to 3 days, but then you are back to normal. This laser-assisted lipolysis procedure is performed using a small cannula (or tube) about the size of the tip of a pen, which is inserted under the skin. Numbing medication is inserted into the area, so that no pain is felt. The laser delivers energy directly to the fat cells through the cannula, causing them to rupture. The liquefied fat is then gently suctioned out. New collagen is produced, resulting in tissue tightening which prevents loose skin after the procedure. The three laser wavelengths contained in SmartLipo TriPlex allows us to customize treatments based on the nature of your concerns. Afterwords, the area will need to drain the liquid used to numb you. You will see some swelling for anywhere to 2 to 7 days as the skin, nerves, and area heals itself. You will feel some soreness - like you exercised too hard. Once that fat between the skin and the muscle is removed, it can never come back. "Not only did Dr. Farag make my thighs skinnier, he was able to remove all the cellulite I had there. He really is a perfectionist. I just love him." L.P.
Dr. Farag has successfully performed this procedure hundreds of times - on areas such as abdomen, upper arms, inner and outer thighs, sides, back, and calves. Highly trained in body sculpting and shaping, he is able to give you the shape that you want in a simple office procedure that only takes 4 hours. He also offers free consultations to explain how he customizes each treatment for each person. Located in central Colorado Springs, we are conveniently open for hours that work for you - whether that means early morning or in the evening. 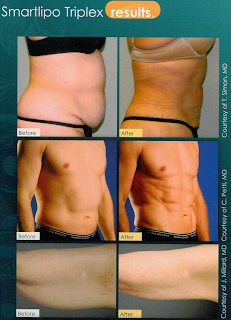 See more details at our website for Smart Lipo information. We are also on Facebook, Twitter, Google+, and Blogger.